Millions of words have been written about Hadrian’s Wall, but none can adequately express the astounding feeling of seeing and touching stones placed, forts built and personal objects recovered from historical Roman sites in Britain, as early as AD40. Of the 84 miles where people can walk parallel to where the wall once stood, only one very short section is still in its original form since the construction 1,883 years ago in AD122. 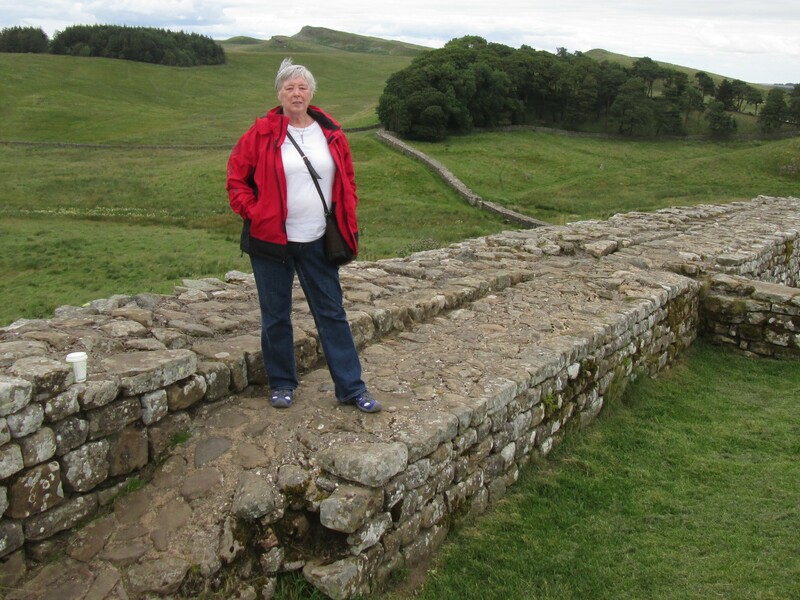 This section at Housesteads, England is approximately 500′ and it is the only place where a person can walk on the actual wall, which is exactly what I did! Although the wall looks relatively short in height where I am standing, if you were to step behind me and look down there is a drop of about 10′. From this vantage point, on a clear day Roman guards could see 360 degrees around and approximately 10 miles distance. 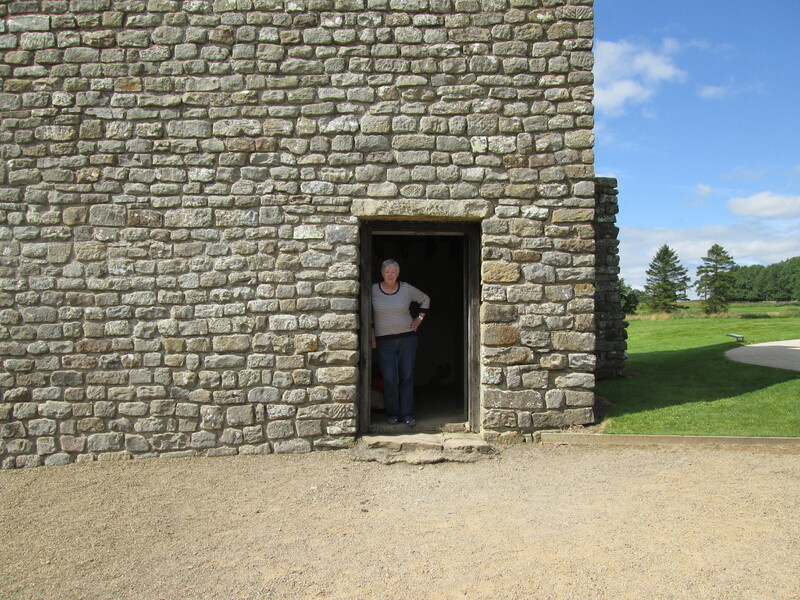 This is the only part of Hadrian’s Wall where one can stand on history. Vindolanda is another site along the wall where excavations have continued for 40 years. While there I overheard a conversation between an archaeologist and a visitor. I felt my jaw drop when he said they could most likely continue uncovering this site for another 200 years, can you even imagine that? When you go to this site, watch the camera move into a reconstructed building and up the stairs because it is exactly where I am in this photo, taken by a handsome Italian man, (Grazie). 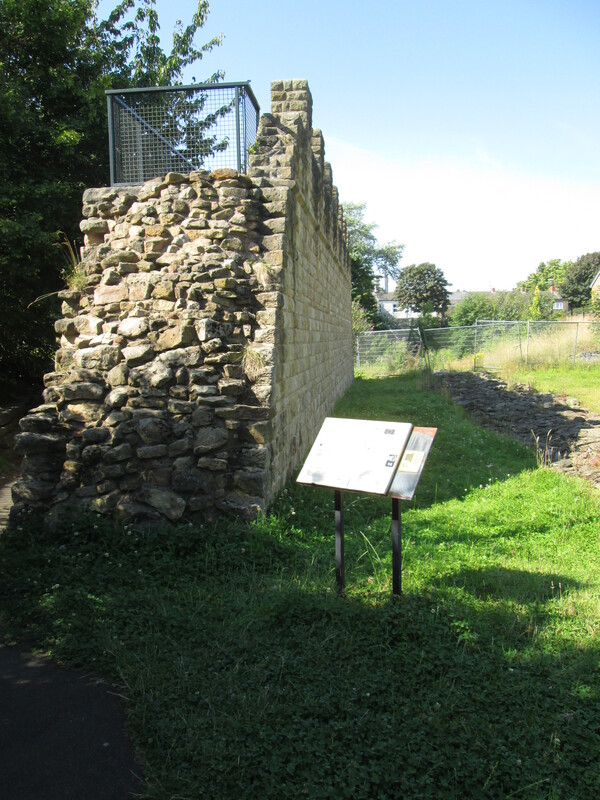 Last stop, for now, is Newcastle, UK at Wallsend (End of the Wall), Segedunum Roman Fort where there is a reconstructed piece of the wall, seen in the photo below. And, last but not least I want to show you the most famous tree in England, on Hadrian’s Wall. It is at Sycamore Gap and is famous because it was featured in Robin Hood, Prince of Thieves with Kevin Costner. Follow this link. I hope you enjoyed this trip back in history. < Previous Victoria Sponge … What’s That? How fabulous. I’m sipping coffee in my pj’s, but feel as though I have just had an exciting vacation. Thank you Sherrill!